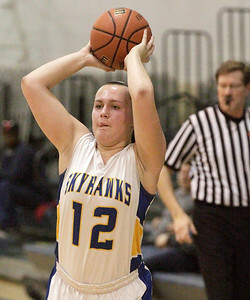 Matthew Apgar - mapgar@shawmedia.com Kayla Stefka of Johnsburg shoots over Ivy Witczak of Resurrection during their IHSA Class 3A sectional girls basketball semifinal game on Tuesday, Feb. 23, 2016 at Saint Vator High School in Arlington Heights. Johnsburg won 50-42 and will face Saint Viator in the final. 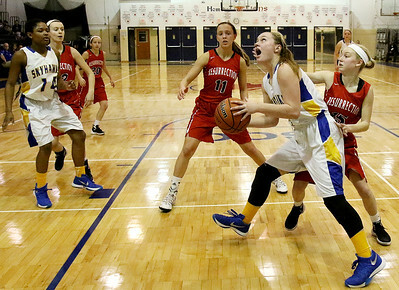 Matthew Apgar - mapgar@shawmedia.com Cortland Sommerfeldt of Johnsburg, center, drives the ball past Gabriella Galassini of Resurrection during their IHSA Class 3A sectional girls basketball semifinal game on Tuesday, Feb. 23, 2016 at Saint Vator High School in Arlington Heights. Johnsburg won 50-42 and will face Saint Viator in the final. 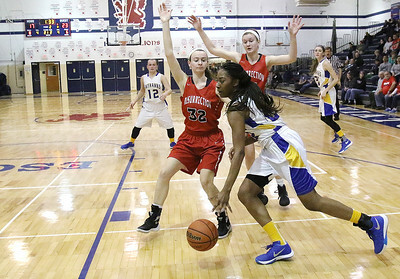 Matthew Apgar - mapgar@shawmedia.com Jazza Johns of Johnsburg dribbles to the hoop past Olivia O'Hehir, back left, and Ivy Witczak, both of Resurrection, back right, during their IHSA Class 3A sectional girls basketball semifinal game on Tuesday, Feb. 23, 2016 at Saint Vator High School in Arlington Heights. Johnsburg won 50-42 and will face Saint Viator in the final. Matthew Apgar - mapgar@shawmedia.com Kayla Stefka of Johnsburg, right, stretches out for the rebound with Ivy Witczak of Resurrection during their IHSA Class 3A sectional girls basketball semifinal game on Tuesday, Feb. 23, 2016 at Saint Vator High School in Arlington Heights. 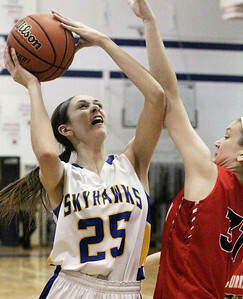 Johnsburg won 50-42 and will face Saint Viator in the final. 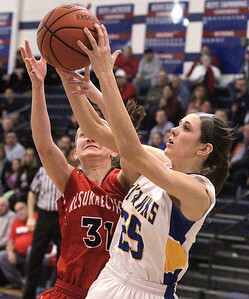 Matthew Apgar - mapgar@shawmedia.com Megan Madsen of Johnsburg shoots the ball from under the hoop against Resurrection during their IHSA Class 3A sectional girls basketball semifinal game on Tuesday, Feb. 23, 2016 at Saint Vator High School in Arlington Heights. Johnsburg won 50-42 and will face Saint Viator in the final. 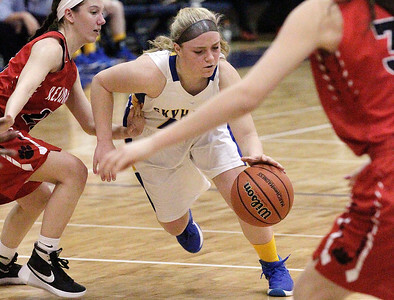 Matthew Apgar - mapgar@shawmedia.com Cortland Sommerfeldt of Johnsburg, right, tries to maintain control of the ball with Gabriella Galassini of Resurrection applying the defensive pressure during their IHSA Class 3A sectional girls basketball semifinal game on Tuesday, Feb. 23, 2016 at Saint Vator High School in Arlington Heights. Johnsburg won 50-42 and will face Saint Viator in the final. 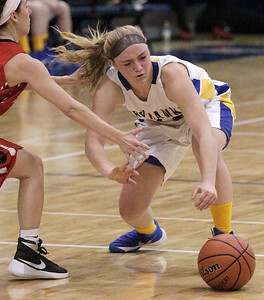 Matthew Apgar - mapgar@shawmedia.com Morgan Madsen of Johnsburg looks for an open teammate to pass to during their IHSA Class 3A sectional girls basketball semifinal game against Resurrection on Tuesday, Feb. 23, 2016 at Saint Vator High School in Arlington Heights. Johnsburg won 50-42 and will face Saint Viator in the final. Matthew Apgar - mapgar@shawmedia.com Aannah Interrante of Johnsburg, right, shoots the ball up in front of Maddie Larsen of Resurrection during their IHSA Class 3A sectional girls basketball semifinal game on Tuesday, Feb. 23, 2016 at Saint Vator High School in Arlington Heights. Johnsburg won 50-42 and will face Saint Viator in the final. 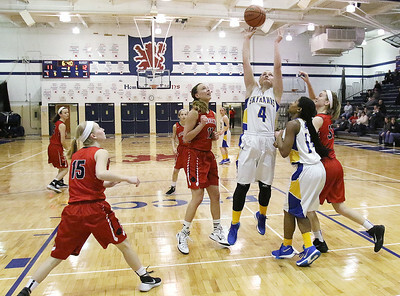 Matthew Apgar - mapgar@shawmedia.com Megan Madsen of Johnsburg, second from right, shoots the ball from under the hoop around Maddie Larsen, center, and Cori Thompson, both of Resurrection, right, during their IHSA Class 3A sectional girls basketball semifinal game on Tuesday, Feb. 23, 2016 at Saint Vator High School in Arlington Heights. Johnsburg won 50-42 and will face Saint Viator in the final. 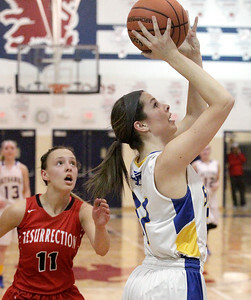 Megan Madsen of Johnsburg, second from right, shoots the ball from under the hoop around Maddie Larsen, center, and Cori Thompson, both of Resurrection, right, during their IHSA Class 3A sectional girls basketball semifinal game on Tuesday, Feb. 23, 2016 at Saint Vator High School in Arlington Heights. Johnsburg won 50-42 and will face Saint Viator in the final.